Along the Little South Fork of the Poudre in a secluded valley is the old mining camp of Cipango. The shaft of the Little South at Camp Cipango is now down 36 feet. Fine looking ore coming from a three foot gold vein every day. The new mining camp of Cipango is steadily growing in popular favor and is destined to occupy a large share of public attention in the very near future. The mineral veins found there are large and very well defined and in solid formations, testing well at the surface and steadily improving as depth is gained. The ore in the Little South which carried $12.00 in gold at the surface is now, at the depth of fifty feet, worth $32.00 per ton, and there is a seven foot vein of it. Like satisfactory results are also being obtained from a number of the other claims that are being worked. The camp is lively, nearly 100 men being at work prospecting and sinking on claims already located. Manager Safely of the Cipango company, is saving and sorting the ore coming out of the Little South and expects to soon ship a car load for treatment. The shaft on this claim is now down fifty feet and in a seven foot vein of fine looking ore.
Ed York of Denver, came to camp on Monday, having just completed the survey of a town-site at Cipango, the plat of which will be filed this week with the county clerk. He reports the miners and prospectors in good heart and steady, faithful work in progress on a number of excellent claims. John Dyer came down from Denver on Wednesday and will go the Cipango tomorrow with a force of men to work on a contract to sink a 100 feet on the Prince of India lode in that camp. Mr. Dyer who is an experienced miner, has great faith in the future of Cipango. 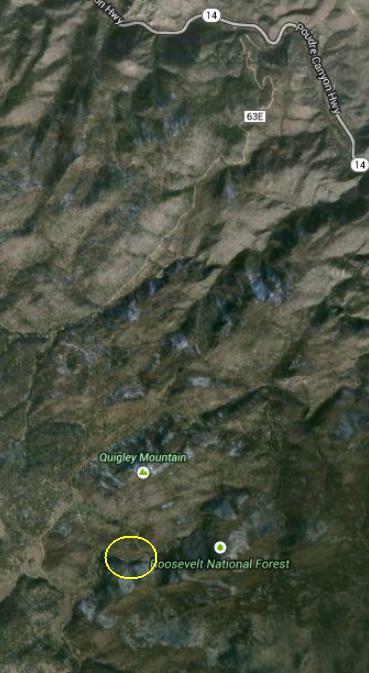 Google map of the area where Cipango was. Cipango according to the above article would have been with in the yellow circle. Cipango was a term used by Marco Polo describing one of the islands of Japan. The site is about 25 miles northwest of Fort Collins east of the Pingree Park Road on private property. Gold price in 1898 was $18.98 per troy ounce. On December 18, 2013 the value of gold was $1,234.00 per troy ounce. Col. Warner A. Root, S2, one ot the best known mining correspondents and writers in the west, died at the Soldiers' Home In Sawtello, Calif., according to word received here. Col. Root was born In Vermont in 1841 and enlisted in the Massachusetts volunteers at the opening of the Civil War, serving continuously throughout the war and finishing as one of Sherman's veterans. In the early seventies he went to Colorado was city editor of the first newspaper in Leadville. For many years he was the traveling correspondent of the Chicago Mining Record and in such capacity he was a familiar figure in practically every mining camp west of the Mississippi River. Barnes Camp was near the Little South flows towards the northeast away from the Pingree Park road. These mines did not 'playout', poor economics and transportation prevented the mines from reaching their potential. One of the old timers perhaps misinformed me as to the location of the old mining town of Cipango. 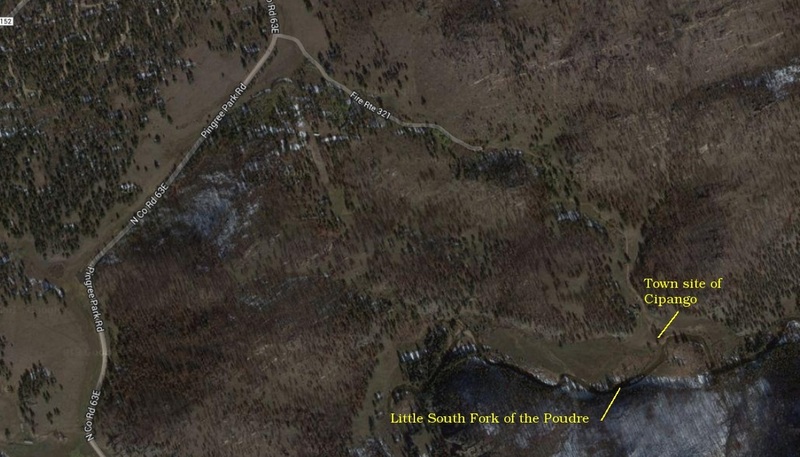 The town-site occupies a lovely location in the valley of the Little South Poudre about two miles below Barnes Camp. About 150 lots have been laid out and staked on both sides of the stream abutting wide streets and broad avenues. The two principal streets of the town are named Teller and Bryan. The article in July 2, 1896 Fort Collins Courier points out that Cipango was on the Little South. The site I point out as the town site is about two miles from Barnes Camp which was about 3/4 miles up Beaver Creek from it's confluence with the Little South. The area I indicate is the only stretch of the river valley that would allow having the town span the river - be on both sides.